Basically, in this episode Cartman joins the NSA hoping to blow the whistle on their government surveillance program from the inside. And despite exposing the truth – the weird, whacky truth which I shall I not mention for fear of spoilers – no one seems to care. 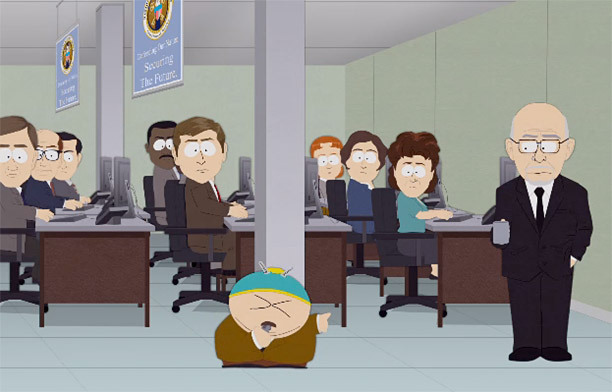 Cartman goes home thinking he needs to move to Russia since he’s now a whistle blower and this is what they do. And interestingly enough, in a separate thread, the naive but loveable doormat Butters hears from Cartman that the government is watching them all the time and interprets it in rather… religious terms. That night, he chooses to pray to the government, thanking it for watching over him and letting it know what he wants for Christmas. As if that wasn’t enough, when he sins, he goes to the DMV to confess and says the Pledge of Allegiance as if it is a Hail Mary. He also recruits a bunch of Jehova’s Witnesses come to his door and begins going door to door, telling others about how the Government wants to forgive them and be let into their hearts. 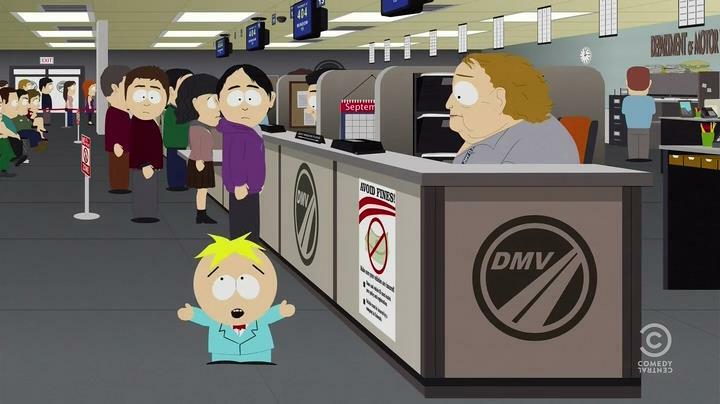 Thanks to Butters and his followers, the DMV becomes a church in its own right, with prayer services and sing-alongs. Terrible no? And yet, somehow very spot on! New Cover for Whiskey Delta! So weird. So, so weird. This is even more ridiculous in its mockery of our current state of affairs today. I happened to watch part of an episode of “The Good Wife” where the techs at NSA discover that Alicia Florick’s home phone was called 12 times in one day by someone who may have links to some terrorist cell in the middle eat. It turns out,the caller was Alicia’s teenage son’s lovesick girlfriend, there’s more to it but I don’t want to giveaway the twists and turns that make the whole NSA eavesdropping for a good reason they claim, so absolutely ridiculous! How much more will they trample on our civil liberties before they admit we’re not much better than China or Russia?